I should check my spam box more often. This is what I found there! Below is an open letter from SportsConnection, the company behind Champion brand, apologizing for the lack of organization during the Champion Run. I don’t know about you, but running brings so much positive energy into my life that I refuse to taint it with any unpleasant thoughts or harbour ill feelings towards anyone. All I can say to the management of SportsConnections is this: please learn from your mistakes and make sure that in next year’s run (if there is any) you will: 1) have more water, 2) more marshalls, 3) start on time, 4) provide water at the end of the finish line, and 5) coordinate closely with your race organizer (When you put your name on it, it is your race. Its success or failure becomes yours too.) Peace—I have forgiven and forgotten! I don’t know about the rest. To other runners of the Champion Race, feel free to post tactful comments and suggestions for SportsConnection to realize areas of improvement. On behalf of SportsConnection, we would like to thank everybody who joined the Champion Run. We appreciate your participation in our first run event. We would like to take this opportunity to apologize to those who have been inconvenienced by lack of water in the hydration stations set up by Fort Striders, the group we commissioned to be our race organizer. We have distributed (personally handed) to the runners more than 2,800 bottles of mineral water and soft drinks together with some snacks and the certificates. Please note that as soon as our president, Adi delos Reyes, found out that the stations have run out of water, he immediately instructed our staff to go get more water for the runners. The problems you mentioned (water and not enough marshals) were supposed to be taken cared of by the race organizer. It clearly states in the contract we signed with them that they will provide water in the hydration stations, take care of the race technical aspects as well as the sound system to which we have also heard several complaints. Their shortcomings had boomerang on SportsConnection especially our brand, Champion. We do not mean to point fingers at anybody. We take responsibility for the problems in our event but have trusted that our race organizer would take care of these aspects. Please be assured that we only want the best for the runners as well as the sport. It is our vision to help and support PSC athletes and Gawad Kalinga. We hope that you understand SportsConnections’ side because we too have been a victim here. All these we have taken note of and we assure you that this will definitely not happen again. Boycotting our future events and our products is most unfair. We appeal for your kind understanding. 6 Days to Register For Run For P.E.A.C.E. I just registered for the Run For P.E.A.C.E., have you? For the past week, I could simply not decide between the 5k or 10k due to the cacophony of voices yelling out their oh-so unsolicited advice. My legs were begging me to just go for 5k because I had abused them during the Champion Run. My laptop was telling me to run the 5k because, as iCal mentioned, I had a business trip to Batangas scheduled for June 9, the day before the race. My brain was telling me to sign up for 10k as it had intelligently concluded and I quote “the 10k would be highly achievable without undue stress to your body as intensive training shall prepare you for it.” Aaaah, decisions decisions. This morning, I met Coach B, Annie, Mayi and Jamike for our usual run at Alabang. Annie and I ran for 1 hour covering around 10k at our usual pace taking our regular route. There was nothing unusual today, but my run was exhilarating. It was tiring (my legs were very stiff towards the end) yet it was pure bliss. Driving home from the run on an adrenaline high, I threw all rational thought to the wind and decided to join the 10k. I dropped by NCRTS at Camp Bagong Diwa this morning to register for the run. Mr. John Familara, the affable Finance Officer of NCRTS, helped me out with registration and proudly spoke of the upcoming race. I was pleasantly surprised to learn that the run will be carried out in 13 regions—from Baguio to Caraga—all at the same time with an estimated 3,000 participants in each race. Whoooaaa, incredible! 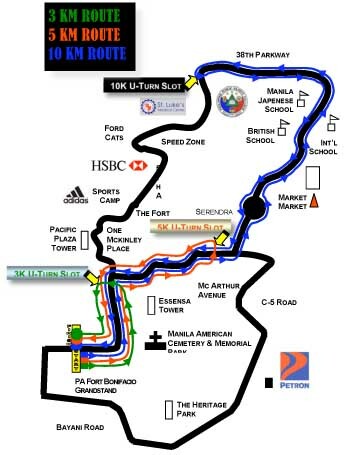 For some reason, the thought of running alongside (well, in spirit) other Filipino runners across the country got me more excited for the race. As if I’m not excited enough eh?! 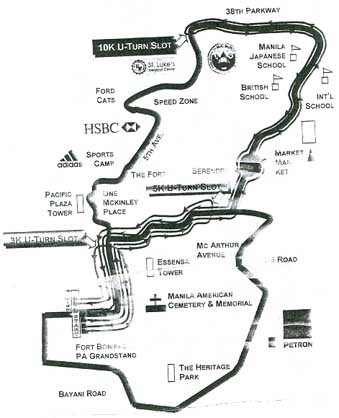 Run For PEACE (3k/5k/10k/15k/21k) will be held on June 10, 2007, Sunday, 5 a.m. at Global City, Fort Bonifacio. Registration is on-going until May 31, 2007 at the National Capital Region Training School in Camp Bagong Diwa, Bicutan, Taguig City. (I had no idea where this was, so just in case you’re as clueless as I was, here are the DIRECTIONS: Southbound on South Super Highway, exit Bicutan. Make a left towards the market. Straight ahead. You’ll see Camp Bagong Diwa on the right) Or, of course, you can register on site! Call Prof. Jove Usana at 531.3487 or 0919.690.1295 for more details. Have you registered for the Champion Run? – Registration Fee: P150 per entry. Each finisher gets a singlet. Hurry, registration ends on May 16, 2007!